This Spring, the Bahamas released their first Bahamas-wide report on the state of their nation’s coral reefs. 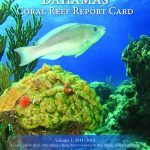 The 2016 Bahamas Report Card includes the condition of reefs, identifies threats affecting them and outlines strategies to help improve reef condition. The report is based on 214 AGRRA coral reef surveys conducted between 2011-2013. Read a recent news article by The Nature Conservancy’s Felicity Burrows in the Caribbean Journal.